Login as practitioner to view Wellness Recommendation. Gut Structure and Function: The lower gastrointestinal tract consists of the small and large intestines which are referred to as the gut. The gut has a multi-layer system made up of gut microbiota, mucus, and epithelial cells. The microbial barrier or the gut flora consists of commensal friendly or probiotic bacteria that not only provide nutrients such as ferment fiber, release short-chain fatty acids, and synthesize other key nutritional components such as Vitamin K2, it also suppresses the growth of unfriendly bacteria such as yeast. The mucus layer is produced by the Goblet cells in the intestinal lining which prevent bacteria from adhering to the gut lining and regulates diffusion to the host tissues by filtering the toxins from being absorbed. 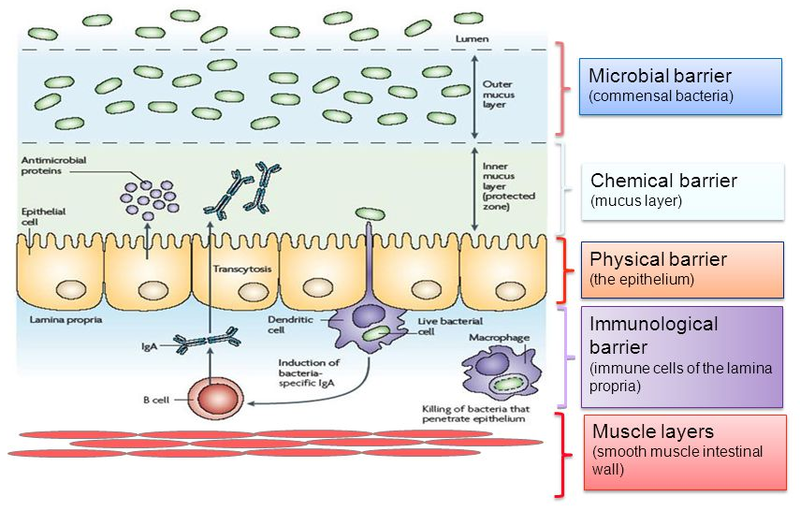 The intestinal epithelial layer forms the most important barrier between the internal and external environment. The tight junctions are responsible for sealing the intercellular space and functions as a selective/semipermeable barrier that facilitates the passage of ions and solutes while stopping the passage of antigens and toxins. 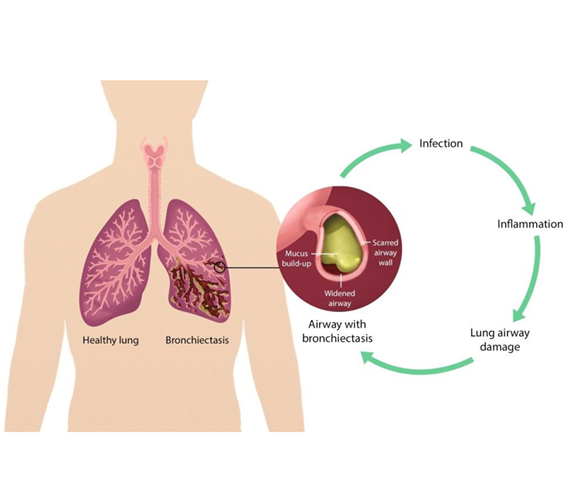 The immunological barrier sorts between pathogens and bacterial microorganisms as well as regulates the immune tolerance and response to pathogens. Symptoms: Leaky gut is a condition that results from increased intestinal permeability that occurs when the tight junctions in the gut loosen or become disrupted and allow substances such as bacteria, large food particles, and other unwanted substances to leak through into the bloodstream. 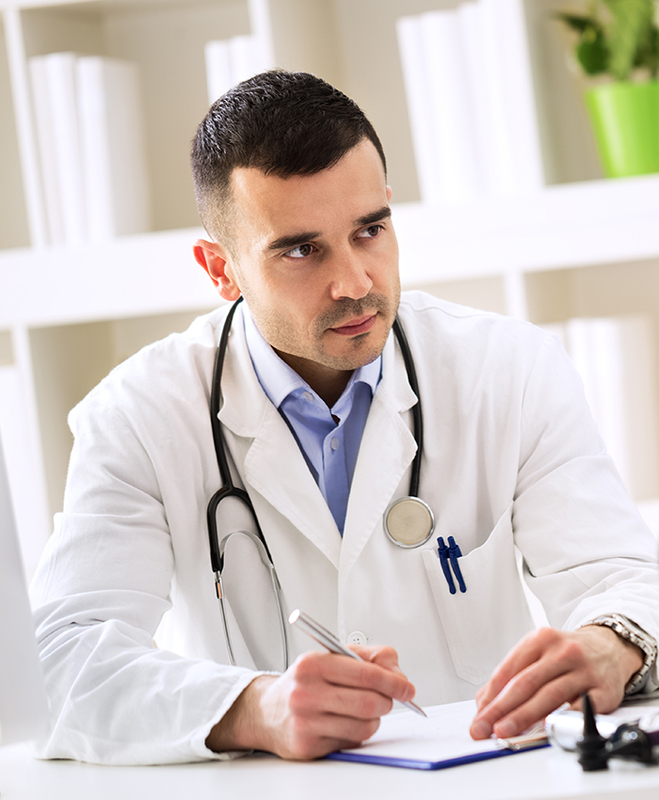 The symptoms of leaky gut are shared with many other conditions, making it hard to diagnose. 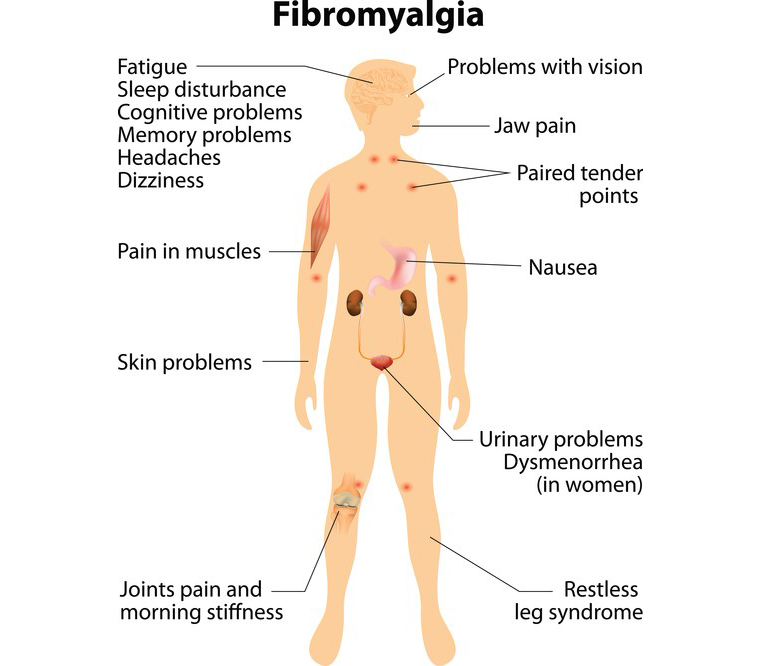 Symptoms include food allergy, gluten intolerance, brain fog especially after eating, bloating and gas. Chronic diarrhea, nutritional deficiencies, headaches, fatigue, skin rashes or eczema, cravings for sugar/carbs, joint pain, anxiety, depression, poor memory, easily distracted and difficulty completing projects are all common among leaky gut patients. Causes: Although the cause of leaky gut and the disruption of the tight junction is still under speculation, the theory is that it is the result of damage to the intestinal lining from genetic predisposition, diet, drugs/antibiotics, or a compromised immunity. Degeneration of the stomach lining due to gastritis or other chronic stomach conditions and the use of antacid for heartburn can result in low stomach acid production. The lumen pH should be maintained at 1-2. The low pH is required to destroy pathogens, induce and activate the digestive enzyme, pepsin which digest protein into polypeptides. At higher pH due to reduced stomach acidity, the food intake can't be fully digested and the bacteria can't be fully sterilized. When the improperly digested food with excessive amounts of germs enter into the small intestine, it can cause small intestinal bacterial overgrowth, otherwise known as SIBO. SIBO has been identified as one of the possible causes of leaky gut. SIBO is a condition in which excessive bacteria is present in the small intestine causing diarrhea, weight loss, and malabsorption. This bacterial overgrowth causes intestinal inflammation and damages the lining of the intestine, therefore, causing increased intestinal permeability. When the overgrown bacteria enter the pancreatic duct, it can also cause pancreas inflammation leading to pancreatitis. Use of antibiotics or the intake of food that contained antibiotics or pesticide can disrupt the gut flora causing a reduction in the friendly microbial population. The unwanted bacteria, therefore, lose the inhibition and start populating afterward causing SIBO or candida yeast overgrowth resulting in intestinal inflammation and increased intestinal permeability. When increased amounts of antigens and pathogens pass through the epithelial layer, they can trigger a severe immune response causing an increased amount of tumor necrosis factor-α and interferon-α that have been shown to further increase intestinal permeability, a vicious circle leading to the development of leaky gut syndrome. Alcohol, NSAIDs, and pathogens can also cause leaky gut by inhibiting goblet cells causing reduced mucin production. With a thinner layer of mucus barrier, the epithelial cells of the intestinal lining lose its protection and, therefore, are prone to injury causing inflammation and increased permeability. Chronic alcohol consumption has been associated with leaky gut through the byproduct of ethanol metabolism, acetaldehyde and nitric oxide, leading to an alcohol-mediated barrier dysfunction. Experimental studies in rodents have demonstrated that acute administration of alcohol induces mucosal damage in the small intestine including villus ulceration, submucosal bulging and hemorrhagic erosions and intestinal barrier dysfunction1. NSAIDs, which have been shown to cause GI side effects, contribute to leaky gut through the production of ulcers, perforation, and hemorrhaging within the intestinal tract. A study performed on healthy individuals which consisted of both chronic and acute ingestion of NSAIDs demonstrated an altered intestinal barrier dysfunction and hypermotility. Interactions between pathogens and the intestinal epithelial cells often lead to a disruption in the intestinal barrier. Pathogens can alter the fluid and electrolyte transport across the intestinal barrier as well as induce an inflammatory response. Pathogens can do this by binding directly to the cell surface molecules and inducing changes in the tight junctions or by promoting cell damage and death which alter the epithelial ion transport, therefore, disrupting the tight junctions. The nutrients and other substance that pass through the intestinal lining are collected to the portal veins and carried to the liver for further metabolism and detoxification. 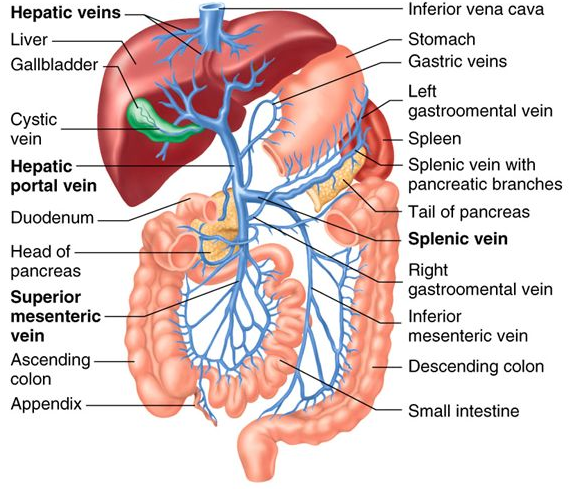 The blood will leave the liver to the heart through the Hepatic vein. With leaky gut, an excessive amount of undigested food particles, bacteria and toxins will be loaded to the liver which can become overwhelmed and congested. Such chronic overload can exhaust the liver and cause a liver deficiency and its detoxification capacity can be greatly reduced. This explains why patients with leaky gut usually also experience liver related symptoms such as anxiety and emotional issues. 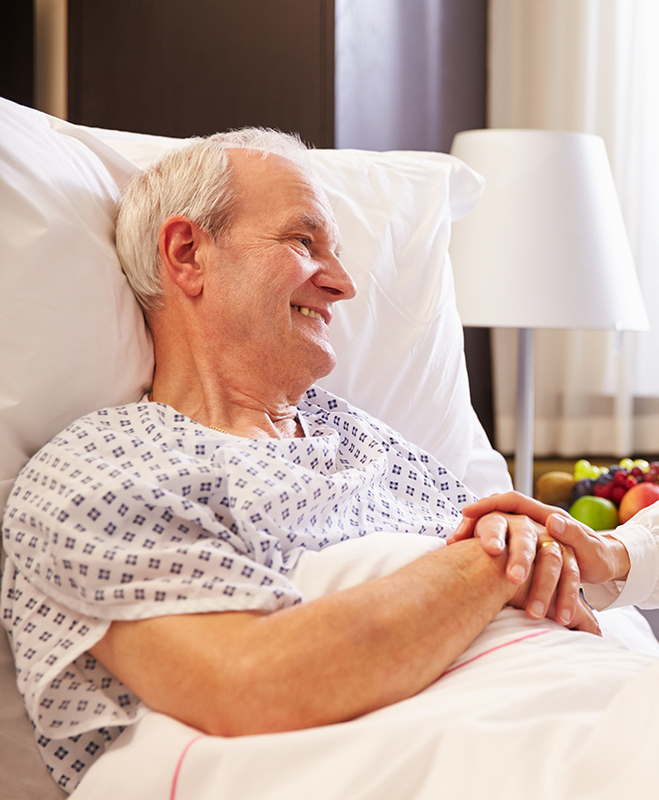 When the liver is malfunctions, food particles and toxins can then enter into the blood stream causing systemic symptoms and disrupting brain function. Therefore, patients will experience brain fog especially after meals, headaches, poor memory, fatigue, skin rashes, joint pain, etc. in addition to digestive tract symptoms such as chronic diarrhea, bloating and gas, food allergy or sensitivity, cravings for sugar/carbs etc. Associated Diseases: Increased intestinal permeability has been suggested to be a causative factor predisposing to disease development of GI diseases as well as systemic conditions. 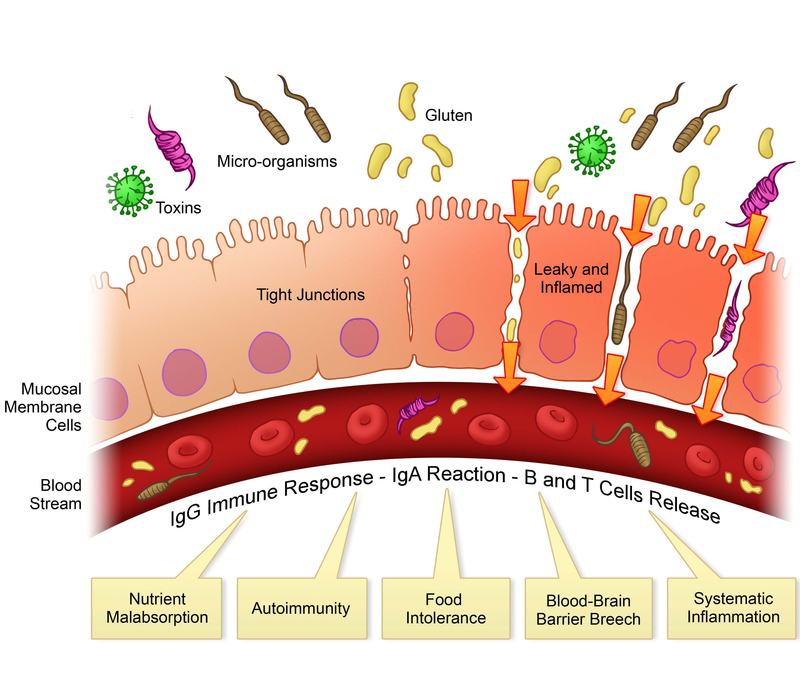 Food allergies are thought to be tied to leaky gut since the impaired intestinal barrier function allows food particles to pass through the intestinal barrier leading to an immune response. The definition of a food allergy is an immune response to a food protein, called an antigen, making leaky gut a very likely cause of this condition. 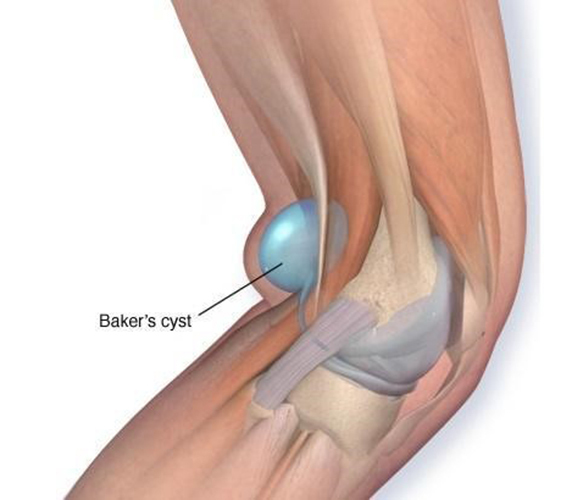 The antigenic food particle and foreign molecules from bacteria can also trigger inflammation and autoimmunity including arthritis as some of the molecular structures resembles our own structures such as the knee causing joint pain and swelling. Crohn's disease which is characterized by chronic intestinal inflammation is also tied to leaky gut. Multiple studies have observed an increase in intestinal permeability in patients with Crohn's Disease. 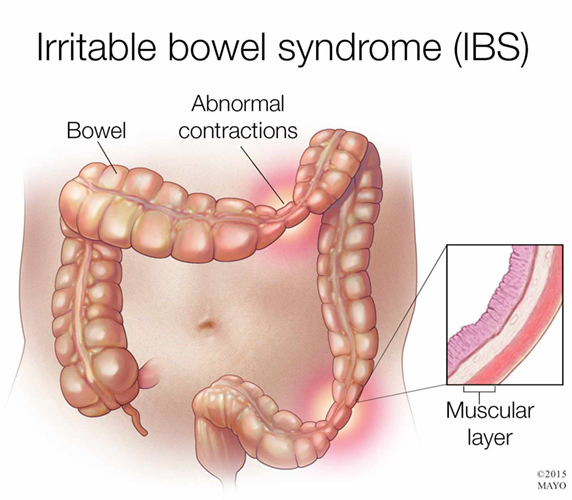 Irritable Bowel Syndrome (IBS) is a chronic large intestine (colon) disorder that can cause cramping, abdominal pain, discomfort, bloating, gas, diarrhea or constipation, sometimes alternating bouts of constipation and diarrhea. IBS patients are also likely to have leaky gut, especially those with diarrhea-predominant IBS. The bacteria or virus that pass through the epithelium can irritate the enteric nerves which regulate intestinal digestion and contractions. Such toxins interrupt the function of the enteric nervous system causing abnormal intestinal smooth muscle contraction leading to chronic diarrhea or constipation. Celiac disease, an autoimmune condition, is characterized by hypersensitivity to gluten and recent studies have found that ingesting gluten considerably increases intestinal permeability immediately after consumption in celiac patients.